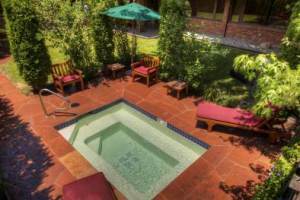 Claim "Aspen Spa and Lodging"
Distinctive Aspen Lodging – Starts at $349.00 per night. Where to smoke? Outside areas only. Free Wi-Fi , Flat-screen TV and refrigerator. Private bathrooms. Herbal sauna & hot tub. Garden and views of Aspen and the surrounding mountains.